A labyrinth is designed with a single path leading to and from its center. Unlike a maze, which is designed to trick the mind, the labyrinth's purpose is not to confuse or bewilder as there are no blind alleys or dead ends within. The labyrinth design combines the circle and the spiral form found throughout the universe - from the galaxies to our DNA - which is a symbol for wholeness, unity and transformation. It’s an "Intuitive Playground,” where we invite a deeper, more knowing part of ourselves to come out and play. Labyrinths are considered by many to serve a holistic function, namely to further those who are on a path to a more balanced psychological, emotional, spiritual and physical well-being. Walking the path is a wonderful opportunity to slow down and connect with spirit. In most cultures, labyrinths celebrate life's major events. At it's most basic level the labyrinth is a metaphor for the journey to the center of your deeper self and back out into the world where you broaden the understanding of who you are. 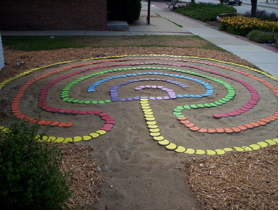 Solcare's labyrinth shows the paths of the labyrinth in the colors of the seven major chakras of the human body. By focusing on the chakra colors as you walk the labyrinth, it will assist in bringing your physical body into balance. During this stage you walk the path toward the center in a relaxed, peaceful state, release concerns and quiet the mind. The time in the center. This is a time of openness and peacefulness; you experience, learn or receive what this unique moment offers. The journey outward. You choose when to leave the center, following the same path. This is a time to review and consider what occurred in the center and how it may be applied to your life. This stage represents your life outside the labyrinth - the world where your experience or illumination is carried into and affects your everyday life. Intentional walks: Where you address a specific intention, issue or concern as you walk. Intercessory walks: Offer prayer as you walk. Meditative walks: Meditate on a specific word or passage.